These two giant Buddhist pagodas in Xi'an date back about 1300 years during the Tang Dynasty. They are the only tall pagodas of the historic Tang era still standing. In photographs, the Small Wild Goose Pagoda looks taller than the Big Wild Goose, but it is actually one third shorter. This optical illusion occurs because the small pagoda has 13 floors while the big one has just 7 floors. 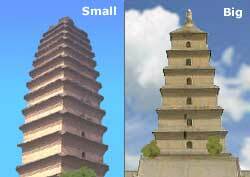 Yet, the small pagoda's individual floors are exceptionally short in height. Walk up the Big Wild Goose Pagoda's spiral staircase for an excellent view of Xi'an and countryside. Do this early or late in the day during the tourist season to avoid long waits. The two Wild Goose Pagodas are a 5 to 10 minute drive south from the inner city of Xi'an, the capital of Shaanxi province. They stand a couple of kilometers (a little over a mile) apart.